I feel like my whole life is one big game of splurge or save. Most of the time I land on the "save" end of the spectrum. Sometimes my skimping is not always the the best route to go. I have bought jewelry from some of those "deal" websites and been burned almost every time--they are either broken on arrival, fell apart or have a funky cheap metal smell. Finally I got some common sense and realized that sometimes the going with the quality item is the way to go--whether it breaks the bank or not. I love that there are stores and sites that offer trendy jewelry that doesn't cost as much as my rent and are have products that are with quality materials. 1. Clasp-- Is the clasp or fascinator attached well? Does it work well/ or easy to open? There is nothing more frustrating that spending 10 minutes in an already rushed morning than wrestling with a unruly clasp. 2. Smell-- Does it have a funny smell? Cheap metals give off a metallic smell that will basically drive you crazy all day. 3. Trendy-ness-- Is the item here to stay for a season or two or is it a one outfit wonder? There are some pieces that it is totally acceptable to spend $5 on and then let it gather dust. What are your biggest "save" tips when buying jewelry? Oooh, love this post! I am always finding jewelry I love, but never buy because I can't splurge! I love when bloggers post on saving $ on clothing and jewelry... shoot anything really! Because most of the time, you all just make us look totally NOT put together! Anyways,I love shopping at Forever 21 and H & M ( or as I call it "grown up Forever 21"). I have also had great luck lately at Charming Charlies. Love this post! I feel like I have had great luck lately at Charming CHarlies, Forever 21 and H & M... or as I call it, Grown Up Forever 21! Great points to consider! I think my big thing is that I don't really shop for jewelry online, since I can't really judge quality... other than that, I usually save on things that are trendy and cute! how can one save when a PERFECTLY BEAUTIFUL kate spade pair of earrings is shoved in her face? IMPOSSIBLE. It's 2Chainz with a Z!!! GET IT RIGHT GURRRRL. just kidding. I only know that for work. You know I'm all about the saving! I bought a necklace (ummm my mom bought it for me) from Charming Charlie's this weekend that's exactly like a Dogeared one I've been lusting over! I'm with ya! 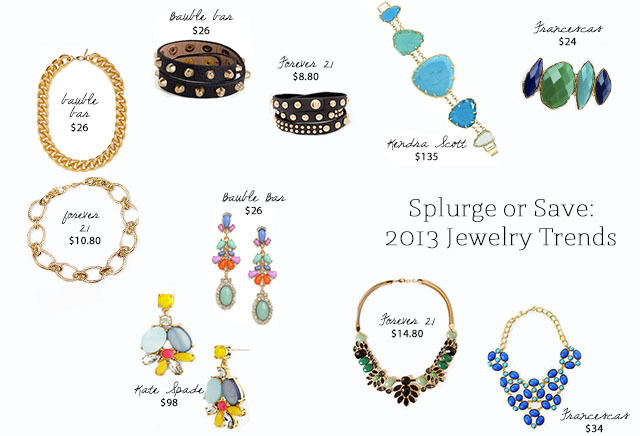 I love statement jewelry, but it is definitely trendy, so not worth splurging on! Be sure to stop by my blog this week--I have a great giveaway going on!